The U.S. Centers for Disease Control and Prevention (CDC) offered some good news on November 8 when it released data showing that smoking rates in the U.S. are the lowest they’ve ever been. Unfortunately, there was some bad news to go with it. 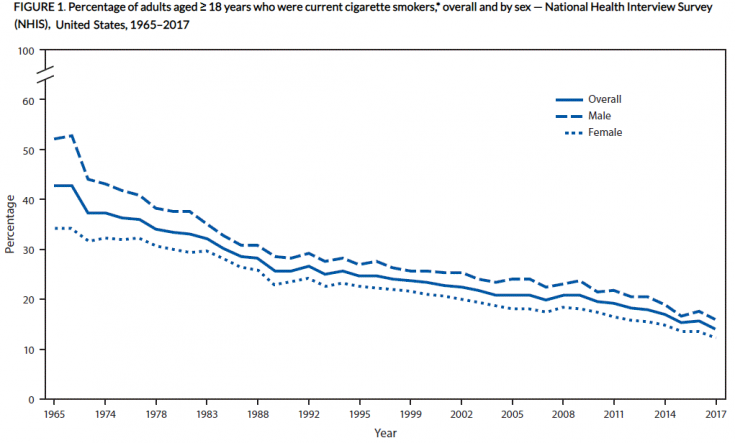 Smoking rates have fallen by 67% since 1965 when the U.S. government first began tracking smoking rates. An estimated 14% of adults smoked in 2017, down from 15.5% in 2016. The rates were even lower among adults 18-24: from 13% in 2016 to 10% in 2017. While smoking rates fell, other forms of tobacco use remain prevalent, including e-cigarettes, hookahs, cigars, smokeless tobacco, and water pipes. About 47 million Americans use tobacco in some form. E-cigarettes have been touted as a smoking cessation method, and many people swear by it. However, overall, the nicotine delivery devices have proven to be more harmful than helpful. Among ethnic groups, non-Hispanic American Indian/Native Americans, multiracial Americans, and white or black adults were the most likely to use tobacco. Adults who identified as lesbian, gay, or bisexual were also more likely to use, as well as those who were divorced, separated, widowed, single, never-married, or not living with a partner. Adults living in the Midwest or the south tended to use tobacco the most. Have you started to see a pattern yet? In many cases, tobacco users tended to be those facing hardship and stress. Indeed, the CDC mentioned in its report that psychological distress was associated with an increase in tobacco use, with 40.8% of adults who reported distress saying they used tobacco compared to 18.5% who reported not being severely distressed. In September, the agency warned 5 e-cigarette makers, including Juul, that they had 2 months to prove to the FDA that they’d taken steps to prevent the sale of their products to young people. The companies were told that their failure to do so could result in the agency requiring them to change their sales and marketing practices, stop their distributing of products to retailers who sell to kids, and the removal of flavored e-cigarettes and nicotine products from the market. Then, in early October, the FDA raided the Juul offices and confiscated thousands of documents as part of its effort to pressure the company into doing more to keep its products out of the hands of young people.